Much of the talk about Wreck-It Ralph this week will be about the fact that it comes out in Digital HD on February 12th–almost a month ahead of the DVD release. I’m all for anything that makes DVDs less relevant, but I think the transmedia strategy behind Wreck-It Ralph is more innovative than releasing a movie digitally. Fix-It Felix Jr. game (Free): You can play Fix-It Felix Jr., the same game from the movie where Ralph is the bad guy. But if you make a movie about a fictional video game character, you’re going to have release the game. Bonus points for bringing a retro style arcade console to the tradeshow E3, complete with scuff marks. Wreck-It Ralph game ($.99): In the movie, Ralph game-hops between his own game and modern games, like the alien combat shooter Hero’s Duty and a candyland racing game Sugar Rush. 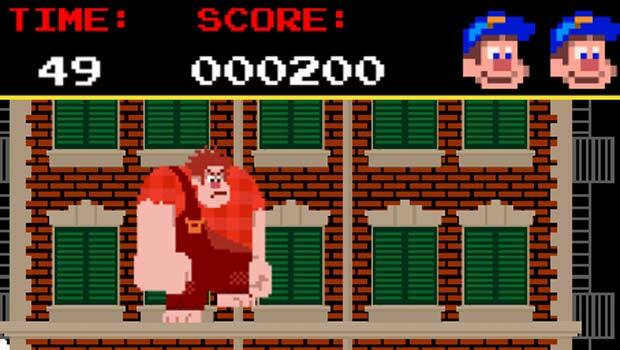 The Wreck-It Ralph app lets you game-hop between those too. You have to play Fix-It Felix Jr. before you can game-hop. At first I was a little frustrated by this, but I also appreciate that it follows the narrative in the film. In the movie, Hero’s Duty is intense with realistic graphics. The app version feels like a retro arcade game I remember called Robotron: 2084. I love this reference, and you’re killing alien insects just like in the movie, but it’s clearly not the same game Sergeant Calhoun is from. (Disclosure: I sucked at Robotron). The online version feels more like a first-person-shooter. Storybook Deluxe ($6.99): Leveling up also means buying up. If you (and I probably mean your kid) want to decorate your own candy racing car like Vanellope von Schweetz does with Ralph, you need to shell out another $7. But that’s only one component of this app. It’s also an interactive storybook of the movie and includes narration and clips from the movie. (I’m looking at the transmedia strategy, not reviewing the apps, so I haven’t purchased this one yet). Hero’s Duty Interactive Comic ($1.99): A comic prequel that focuses on one of the best characters–who actually has a hidden backstory in the movie? Well played, Disney. It’s only 22 pages, which makes me wonder if there will be other comics coming out, perhaps around the release of the DVD? The cynical part of me sees a huge entertainment company finding ways to make more money. But looking at what the creative team accomplished integrating the apps, comics and games into the movie’s narrative makes me think they were aiming for something more than just a digital version of a Happy Meal toy. So what do you think? Transmedia or marketing? Having seen the film but not played the games, from your description it seems like this is marketing on multiple platforms and not transmedia story telling. Had the movie referenced even one of these elements we might be able to tie them together. I might suggest that of all people, Disney could pull off some great transmedia story telling, but it doesn’t seem like that was the goal here.